Altar of Eden is a roller coaster ride. It begins as a scientific thriller, then flips into a monster on the loose "creature feature", and finally ends with a non-stop action sequence. From the bizarre animals to the fruit flavored Lifesaver sucking villain, Rollins attention to detail is very entertaining. "Every James Rollins delivers mach-speed mayhem, throat-clutching suspense, high-style adventure, and a terrific story told terrifically." --Steve Berry, author of The Romanov ProphecyThe thriller king praised for his "edge-of-your-seat excitement" (San Francisco Chronicle), James Rollins storms the New York Times bestseller list with every novel he writes. 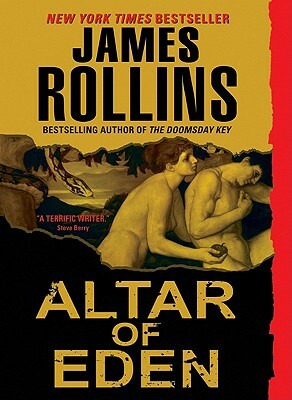 With his latest breathtaking blockbuster, Altar of Eden, Rollins takes a breather from his Sigma Force adventures (Map of Bones, Black Order, The Judas Strain, et al) while delivering all the action, surprise, and intensity for which he's well known--and loved. Combining science, history, and breakneck suspense--and a secret tied to the Book of Genesis--Altar of Eden is sure to satisfy every James Rollins fan while winning over a slew of new converts.